Following yesterday's post, I got an email saying "Your model is very interesting as it helps visualize where any company stands and where it should go (and focus effort). This could help me illustrate the gap between our current situation and an "ideal" one. I was wondering if you could share some more insights about it"
Part of the challenge was to come up with "normalized grades" so the criteria for each level of each dimension are well calibrated. And it seems to be making sense so far. I’m using this expertise as a value-add for my clients and a potential source of consulting revenue, so I'm not really open to share the underlying rules for now. But I can share another example to illustrate the concept. In yesterday's post, I had included a graph showing a real client who had really unrealistic expectations. This other, more positive example, is form a client I met recently. The stated project requirement was simply to move from a log-based solution to the tagged version of the same tool. 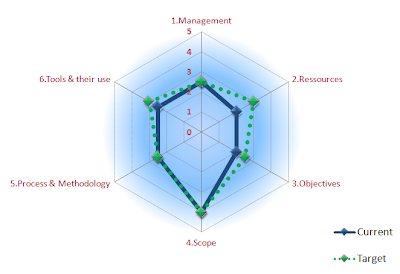 The assessment revealed a good and fairly well balanced web analytics maturity. We used the model as a business requirement information gathering and project risk assessment tool. Doing the exercise, we clearly demonstrated the project wasn’t “only” about implementing tags. If they had been pushing in all directions, or seeking to move more than 1 grade level into a direction, it would have been a warning flag. Jumping ahead two grades is usually a sign of high risk! If you are interested in getting your own evaluation, please contact me.